I've come to realize that I'm 100 times more patient with audiobooks than with regular books. With audiobooks, I can just put my headphones on, and workout, do chores around the house, drive etc etc. If I don't like the book, then I least I didn't waste my time. I thought that Throne of Glass was a perfect example to my weird logic. I'm not saying that Throne of Glass was bad, but I'm the kind of person that to finish a book I have to be engaged pretty early on in the book. The first time I tried to read ToG I didn't feel a connection towards the characters or the plot. But this review right here of the sequel to Throne of Glass by Kim from The Midnight Garden made me want to give this series another try. I don't regret it guys! This was such a great and entertaining read! First of all I have to tackle the love triangle situation going on. The romance in ToG is not as in your face as I thought it was going to be. I'm glad for that. With everything that was going on in the book I wouldn't have liked Celaena to be all: "I love the Prince, but the captain of the guard is so hot that I think I love him too." No. Celaena did enjoy flirting with both Chaol and the prince and got really close to one of them BUT her priority was herself. Winning the tournament and eventually her freedom. I appreciated that. I can't say which guy I prefer because I really don't know who to pick. My heart wants to go with Chaol because Dorian is already a prince it wouldn't be fair for him to get the girl too. Dorian is so adorable, though. I'm Team Celaena...for now. My favorite part about Fantasy books are the politics and conflicts between kingdoms. I absolutely enjoy a book with complicated plots and evil kings and whatnot. Throne of Glass has this whole thing going on, but it moves a bit slow for my taste. Take the Lumatere Chronicles or The Seven Kingdoms series. These series moved along pretty fast and something mayor was accomplished in each book. So if what I heard is true and this series will be six or seven books long then I'm afraid I will lose interest in it as time goes on. Let's hope not. I definitely love the characters, and I think the next books in the series will be a lot better and have a lot more magic in them than this one. 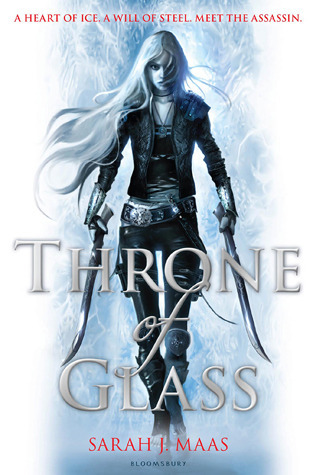 I loved Throne of Glass. Celaena and the rest of the characters are amazing. The writing was excellent and the author did a great job with the world building. I think fans of YA fantasy will enjoy this one. I bought this book recently and I really hope I enjoy it! I hope you like it too! I'm in the second book right now and it gets even better! Haha! I hope Kim doesn't mind sharing because I want me some Chaol. I hope you get to read this one soon, Wendy, because it is really really good! Chaol is even hotter in book 2! Definitely Missie! Celaena is such an amazing heroine! Let me know if you end up reading it! YOU DON'T UNDERSTAND HOW THIS MADE MY DAY!!! I'm so glad I convinced you and you LIKED it!!!! :D Book 2 is just a world of heartbreak. Prepare!! OMG girl! I'm on book 2 and almost done. My heart broke into tiny little pieces already I don't think I can handle any more. But you were so right about book 2 being better than the first one. I'm so amazed! I can't wait to see where this series goes! This is one of my most favorite YA series, I just love it and that is saying a ton because fantasy normally isn't my thing at all. If you haven't read all the novellas I highly recommend them as well, they add so much to the story and to Calaena's character. Yay!!!! As soon as I finish Crown of Midnight I'm definitely reading the novellas! I can't wait!! I can't wait for you to read it! I'm looking forward to see what you think! I love Graceling!!! I think you'll love this one. I don't think the politics get too complicated. I do recommend the audiobook. The narrator is really good! I can't wait for you to try it! I hope you get to it soon! You won't regret it! I'm glad you ended up enjoying the audio book. I've had this one for a long time and it's one of those series I've been meaning to start, but haven't gotten around to. Great review!